As well as the payroll and HR software company has performed, its long-term potential remains enormous. 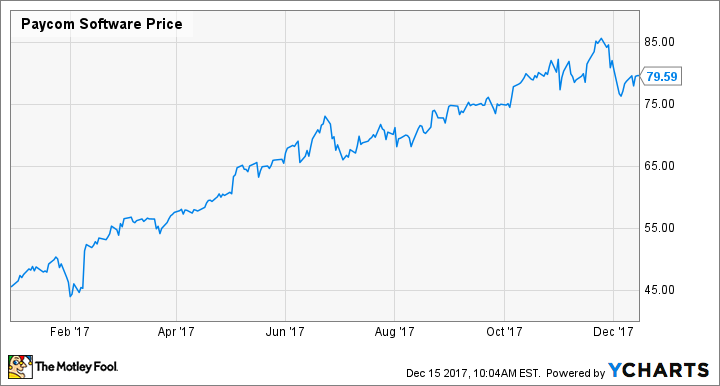 As 2017 winds down, Paycom Software (NYSE:PAYC) investors find themselves with plenty to celebrate. The company's stock is up around 75% year-to-date, as the rapidly growing payroll and HR software provider appears to be firing on all cylinders. Throughout the year, Paycom has continued to make inroads with smaller companies in its 50-to-2,000-employee niche, mostly at the expense of larger competitors like ADP (NASDAQ: ADP). Here's a look back at the most significant items that caught my eye over the past 12 months. In each of the three quarters it's reported this year, Paycom has beaten its own guidance as well as analyst estimates, and then raised its full-year guidance. As the company sells its software on a subscription basis, the vast majority of its revenue is recurring in nature. While that certainly helps give the company good visibility into future quarters, management's track record of under-promising and over-delivering has been impressive nonetheless. With one quarter remaining to report this year, Paycom's guidance and analyst estimates both call for full-year top-line growth of 31%. Don't be at all surprised if Paycom trounces expectations once again when it next reports. However, as 2017 played out, its margin hasn't declined at all. Instead, it's heading for an all-time record as its latest guidance implies an adjusted EBITDA margin of roughly 31% for 2017. If Paycom can achieve that, it will have nearly doubled its margin over the past five years. The company should continue to benefit from its increasing scale in the years ahead and has set a long-term adjusted EBITDA margin target of 30% to 33%. 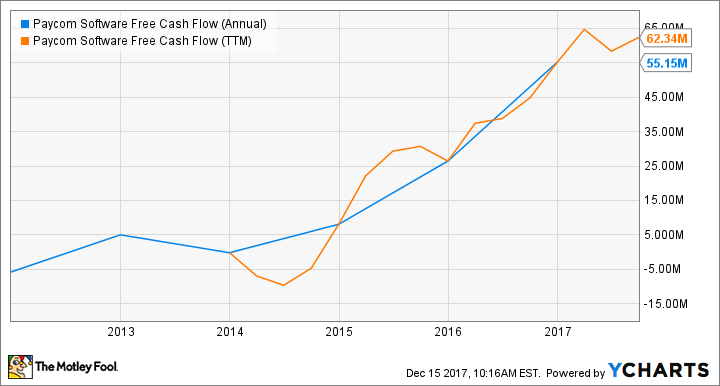 After turning free-cash-flow-positive in 2013, free cash flow increased from $8 million in 2014 to $55 million in 2016. Since Q4 is yet to be reported, we don't have a 2017 figure yet, but on a trailing-12-month basis, Paycom's free cash flow clocks in at $62 million. This type of content can be expensive for the smaller companies Paycom targets to produce themselves. If Paycom sees good uptake of these courses, I'd expect many others to follow. As it creates a more comprehensive library of content, this should help drive increased adoption of its LMS module, giving Paycom another avenue for incremental growth. Paycom continues to build its sales team, adding three new sales offices this year for a total of 45. That's a little more than a third of the way to what CEO Chad Richison believes is Paycom's ultimate potential of 120 offices, which provides a long runway for growth by itself. However, two comments by Richison earlier this year provide the clearest indicators for Paycom's ultimate potential. First, Richison has stated that Paycom's ambitions include growing toward $1 billion in annual sales. And keep in mind that goal is just for revenue generated by the sales team, which would be in addition to any recurring revenue Paycom receives from its current customers. The company's recurring revenue in 2016 was $323 million, and that figure continues to grow quickly. Secondly, Richison said that while half of American workers are employed by the smaller businesses Paycom targets, on an annualized revenue per employee basis, Paycom currently represents a mere 2% of its total addressable market. That perspective provides some incredible upside for Paycom's growth. It's been another great year for this well-managed company. With its track record of robust growth, rising margins, and increasing free cash flow -- not to mention plenty of rapid expansion still ahead -- investors should feel pretty good about Paycom's prospects heading into 2018.